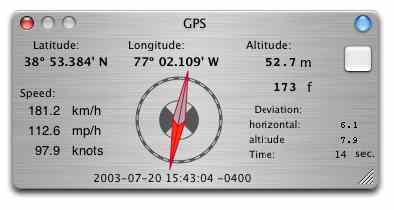 SimpleGPS is, as its name stated, a small utility to display information produced by some GPS receivers on for computers running Mac OS X. It is mainly designed to be a tool for viewing all kind of informations while traveling or hanging around. SimpleGPS has no mapping, tracking or storing functions whatsoever of its own. The program supports only the NMEA 0183 protocol (inofficial sources are here or here), which uses exact specified ASCII-strings and requires a transfer-rate set to 4800 baud. Because only serial receivers are available, only those are supported. Meanwhile there are some bluetooth GPS-receivers available, but those are still very expensive, and they have no other advantages. This keeps in mind, that GPS is a 20+ year old technology, based on even older standards. The most important feature is the display drawer, opened with the blue button in the upper right corner of the window. Every single information can be shown there in large letters. In this way the program can be used as kind of an atomic watch, or as a speedometer in knots, mph or km/h. This is a real advantage and one option every user should use, because no other software of this kind has a nearly comparable feature. Other features are an additional compass window, just in case a big compass is needed, and a window to display the satelites in view, the most useless and therefore interesting information for GPS-user. The graphics in these windows can be changed in many ways. The controlls are hidden in drawers, which can be opened by pressing the blue button. Wait until the download is complete. If your web browser and system are properly configured, Disk Copy will launch to open and mount the downloaded disk image. If this does not happen, locate in Finder the .dmg file that you downloaded and double-click it to open the file using Disk Copy. When the disk image mounts, a new Finder window will open that contains the icon for your SimpleGPS application. Simply drag this icon to your Applications folder (or wherever you would like to keep it) to install. This copies the application from the virtual disk image onto your hard disk so the application is there for you to use whenever you like. Once SimpleGPS is installed you can safely 'eject' the virtual disk that it came on and also dispose of the .dmg file that you downloaded if you choose. Double-click the SimpleGPS icon in the location you installed it in order to begin using the application. You may wish to drag the icon to the Dock for easy access. Now its a good time to install and try to access your GPS-device. Pressing the square button will, if possible, establish a connection. Then all informations provided by the GPS-receiver are displayed in a timely manner according to the satelite fixes, i.e. every second, when a fix is completed. Delays experienced in the user interfaces are a direct result of the 1Hz technology and not an error. Pressing the square button again will stop the data-transmission and disconnect the GPS-receiver. Do not download and install SimpleGPS unless you have a GPS-Device. This program should support every GPS-Device connected through a serial interface at 4800 baud and supporting the NMEA-protocoll. However, it should. Real life is just another story. I've tested only 2 combination, a Garmin GPS II plus handheld with a Keyspan serial-adaptor, and the deluo USB-mouse. Both are serial devices, they are not USB-devices. There driver installs a kernel extension (*.kext), which provides a serial device interface through a file descriptor at start (filepath in '/dev'). Therefor after installation always a reboot is necessary. Although the Keyspan serial driver (for download information look here at their site: serial Keyspan-driver) makes no problems, every filepath is formulated according the location of the device in the USB-environemnt, and, as far as I can see, even unplugging does not cause any problems at all. On the other hand, the driver supplied by deluo, either on CD or on their website, didn't work. However they gave me the information that they are using the Prolific USB-serial converter. On their support-website I found a usable driver (serial Prolific-driver; copy). There is a lot of discussion around the Prolific-driver and its modifications, this driver is nearly used everywhere. In the case of deluo, however, the driver is unchanged, even the USB Vendor-ID remains Prolific. And this driver works, but with some drawbacks. The device filename is always '/dev/tty.usbserial0' or '/dev/cu.usbserial0'. Therefor, while running SimpleGPS and unplugging the deluo-mouse can result in the loss of the whole USB port, which, of course, is a severe crash. I got this situation twice, loosing all input devices (mice, keyboards) and all unsaved data. Don't unplug the deluo-mouse while it is in use, and when it happens accidentally, don't plug the mouse in again. Quit every program you are using, and shut your computer down, before you touch the plug again. The Prolific-driver also has some uncommon behaviour: every second the disk is working. This may be according to the GPS-receiver, because every second a new position is transmitted, but this shouldn't affect the disk whatsoever. There is no logical reason for that ticking noise. Other GPS-devices are not tested yet. Please do not get the idea to buy the slick DeLorme Earthmate® USB-receiver. There is no known driver for OS X and you can't definitively use their software. Don't use any of these devices, including their cables and drivers, until you have a complete understanding of their functionality, and their risks. General technical support for SimpleGPS is not available. It would simply take too much of my time. However, if you have done your homework (i.e., read this document and other documentations), if your problem is with SimpleGPS (as opposed to being a problem with GPS-hardware or other products), and if you are polite and reasonable, I will do my best to help you. As I noticed that there aren't GPS-readers around for Mac OS X, I started programming my own reader, which now has become SimpleGPS. It wasn't an easy task to use a GPS receiver on a computer running OS X, an experience which I might share with some others. However, I needed information about the usability of GPS data for some other projects I am working on, and so the work was done. The icon shows an old navigational device, the astrolab, a predecessor of the sextant. I choose it, because more common navigational symbols like compass, globe or similiar are already occupied by some Web-browsers. To download SimpleGPS, click on the button. The use of this program is free. If you want to make comments or simply drop me a mail, make it available for (SimpleGPS at lonsing dot com). Copyright 2003-2017 Werner Lonsing. All rights reserved. All trademarks are the property of their respective holders.